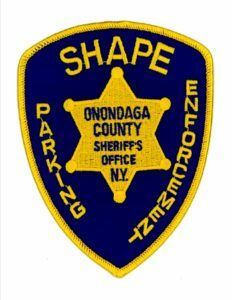 The Onondaga County Sheriff’s Office S.H.A.P.E. Program (Sheriff’s Accessible Parking Enforcement) was established in 1989. The program utilizes the services of community volunteers to provide educational awareness and enforcement activities relating to accessible parking and fire lane parking violations in Onondaga County. The Onondaga County Sheriff’s Office is always seeking volunteers to assist with the Accessible Parking Enforcement Program. Must be at least 18 years of age or older and a resident of Onondaga County or adjoining County. All applicants are subject to a background investigation and an oral interview with the Sheriff’s Office S.H.A.P.E. Commander. Applicants should be willing to volunteer a minimum of four hours per month. Applicants must possess a valid New York driver’s license. Applicant must be trustworthy and have the ability to calmly handle situations with an understanding of the need to abide by the rules and regulations of the program. Applicant must be able to obtain transportation for the performance of assigned duties. If the SHAPE Member has a personal car, the Sheriff’s Office requires proof of adequate automobile insurance. The minimum requirements are $500,000.00 liability and $50,000.00 property damage. It is suggested that a $1,000,000.00 excess liability policy be in place. A copy of the member’s driver license and insurance card must be on file. Provide medical permission to perform duties if required by Sheriff’s Office. Successfully complete the training course for Accessible Parking Enforcement Specialist. Program participants will not be allowed to carry weapons while volunteering. For more information, contact the Onondaga County Sheriff’s Office S.H.A.P.E. Program Administrator at 315-436-6088.